College of the Canyons offensive tackle Justice Spates, quarterback Andrew Brito, defensive lineman Johnny Morrison III and defensive back Khalid Taylor each signed a National Letter of Intent during a brief ceremony in front of the college’s Hall of Fame wall on Wednesday. — Jesse Muñoz/COC Sports Information Director. 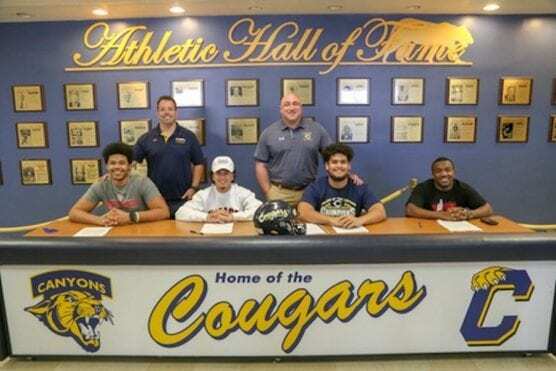 College of the Canyons football had four student-athletes from its 2018 conference champion team sign with four-year schools on Wednesday, upping the total number of signees to eight after day one of the NCAA regular signing period. COC offensive tackle Justice Spates, quarterback Andrew Brito, defensive lineman Johnny Morrison III and defensive back Khalid Taylor each signed National Letters of Intent during a brief ceremony in front of the college’s Hall of Fame wall. The National Signing Day event attracted a small crowd of friends, family, teammates and coaches. Spates signed with University of New Mexico, and will now join teammates Antonio Hunt and Shaddrick Lowery Jr. with the Lobos football program. Hunt and Lowery both committed to UNM during the NCAA early signing period in December. New Mexico is an NCAA Division I program representing the Mountain West Conference. Brito is headed to the University of Massachusetts Amherst after a successful two-year run the Cougars. In 2017, the freshman QB was named the Southern California Football Association (SCFA) National Division, Northern League Offensive Player of the Year after passing for 2,854 yards and 27 touchdowns, and rushing for three more across 10-regular season games. Limited to just four starts as a sophomore, Brito still passed for 1,092 yards and nine touchdowns. UMASS football is an NCAA Division 1 program. Morrison will move on to Wayne State College, an NCAA Division II program in Wayne, Nebraska. The sophomore earned All-SCFA Second-Team honors in 2018 after finishing the regular season with 27 tackles, 8.5 tackles for loss, two sacks and a fumble recovery. Taylor finished the 2018 campaign with 23 total tackles, including 2.5 for loss, and an interception while playing a key role in the Cougars’ secondary. The sophomore defensive back now heads to Southern Utah University, in Cedar City Utah. 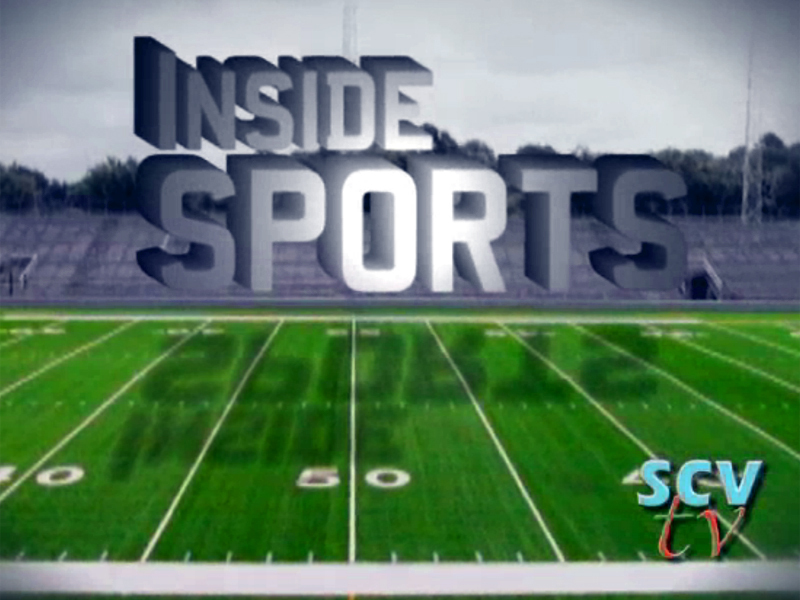 The Thunderbirds are an NCAA Division I Football Championship Subdivision (FCS) school. Wednesday’s group of signees with join Lowery, Hunt, wide receiver Jarrin Pierce (Middle Tennessee State University) and quarterback Wyatt Eget (University of Tennessee at Martin) as the eight Cougars who have signed with four-year schools so far.